The 2008 Mustang GT/CS California Special consists of a $1,895 GT California Special options package which includes California Special side tape stripes, 18-inch polished aluminum wheels with a pony center cap and 235/50/ZR15 tires, and front floor mats with the Mustang logo. The 2008 GTCS is only available in the coupe. Dark Candy Apple Red 2008 Mustang GT California Special (GT/CS) owned by Andy A from Phoenix, Arizona. 2008 Grabber Orange Mustang GT-CS convertible with a 300hp (at 5750rpm), 4.6 liter, 3 valve, V8 engine. The GT California special is a $1895 upgrade over the standard GT premium options package. The GT California special options package includes: 18 inch polished aluminum wheels, 235/50/ZR18 sport tires, front floor mats with Mustang logo, California Special exterior satin black side tape stripe, bright rolled exhaust tips, and a pony center rear gas cap badge. Performance White 2008 Mustang GT California Special coupe owned by Jim Castillo from Portage, Indiana. This is our featured Attitude Of The Week for the week starting June 28, 2015. This GT-CS has the 4.6L V8 engine and an automatic transmission. Grabber Orange 2008 Mustang GT/CS convertible owned by Serge Therrien from Gatineau, Quebec, Canada. This is our featured Attitude Of The Week for the week starting October 18, 2015. Serge tells us more, "I always liked the Mustang. I had one when I was 21 years old. It was a 1981 Mustang Cobra brand new but I had to get rid of it. Once the kids were all grown up, I got a 2003 black Mustang GT. When Ford came out with the redesign Mustang in 2005, looks a lot like the 1969 or 1970 which I love, I know I had to get one. 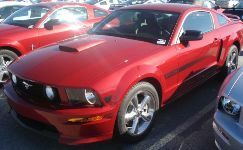 So in 2012 I bought used a 2008 Mustang GT/CS Orange Grabber U3. I get a lot of compliments on the colour. There are not many of them. Mine is 29 out of 113 made in the convertible. Modifications include; two tone light bar with Plexiglass and leather that cover back seat, cold air intake, strut bar, sequential lights and other small modifications. In spring 2014, the best trip ever with my girlfriend took the Mustang across the country to Vegas, Grand Canyon, Highway 66, and also down the Pacific Coast Highway to Santa Monica pier - always with the top down." This Vista Blue 2008 Mustang GT California Special was a the 2010 Mustang car show in Port Angeles, Washington. The hood scoop, side scoops, bright wheels, and fog lamps came standard with the California Special model, but take a look at the custom blue flame grille pony and engine compartment.